I caved into a “trend” piece this season, but only because I think the belt bag is an item that is on its way to being more than just a flash in the pan. I feel like fashion is at a really transitional point right now as we enter the 2020’s and I have been thinking a lot about what looks fresh right now, and what feels bad. As someone whose wardrobe is predominantly vintage, I have to think hard about how to keep my wardrobe looking modern. As someone who spends all day every day immersed in fashion, I have to think about why so much of it leaves me feeling uninspired. I have been thinking a lot about Prada too, and Miuccia’s legacy. Did you know that Prada has all of their show archives available on the Prada site? That was major news to me. That’s where my evenings have gone the last few nights, combing the Prada archives from the 90s. It’s hard to wrap your head around how enormous Miuccia Prada’s impact has been and how singular her vision remains. The simplicity of the early 90s Prada collections are a refreshing reminder that the best clothes don’t usually have to vye for your attention. Lately I have been going back to all of the things that made me interested in fashion in the first place. Comme Des Garcons, Prada, whatever great 80s designers I can snap up on eBay for cheap, my favorite old thrift store finds. It’s good to get in touch with what really inspires you and just tune out the rest for a little while. While I love soaking up all of the fashion shows during fashion month, all the newness makes me crave familiarity. I’ve been happy as a clam styling looks in my clothes room with clothes I’ve had for years, playing with new looks to make the old things feel fresh. I think they call that “shopping your closet” now. I needed to think of a good accessory to pull in that would liven things up. I’ve never been much of a bag person, or maybe I’m too selective with bags to get very invested in them. A lot of designer bags are really aging, too serious or too flashy to be chic. For this reason I have lots of “not serious” bags, like beaded fabric slouch bags from the 80s, or a tiny little Louis Vuitton Speedy found at an estate sale, or a pocket sized leather and tapestry pouch from Wunderkind I found on Yoox. One of my few major bag investments is a Balenciaga City bag in a red nylon satin-look fabric I got years ago. The traditional leather city bag was too serious for my style and I never would have considered it, but when I saw the nylon city bag I needed it urgently. 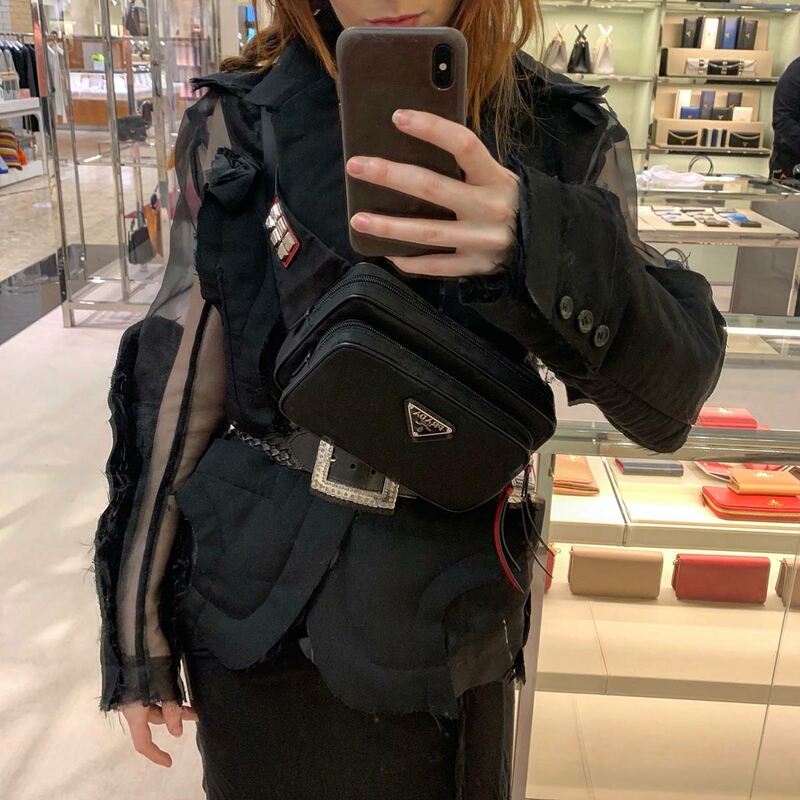 This Prada belt bag was the solution to my present need of an accessory upgrade. It looked great with this Comme des Garcons blazer, it looked great with my Comme des Garcons sweatshirt. I tried it with a hot pink ombre silk blazer I eBay’d and again, success! I only got it this week and so much outfit happiness is already coming out of my purchase. A nylon belt bag is the opposite of frou frou. It lends a bit of toughness and modernity to anything it’s paired with. Check out the Prada 1999 spring collection video for some bug bag realness. It might inspire you to make the move on this bag like it did for me. Belt bags are stunning and they look so cool. Love so much yours! I enjoy all your posts because they are so thoughtful and informative. I love to delve into the history of designs and especially stories behind their creations (that goes for perfumes as well). Is the slip dress you feature also a Prada find? So funny – I was in my 20’s in the ’80’s but now I have a deeper appreciation for the era all due to you! I’m short and short waisted and have trouble with belts. Any advice?! Love you and all you do to add beauty to this world. 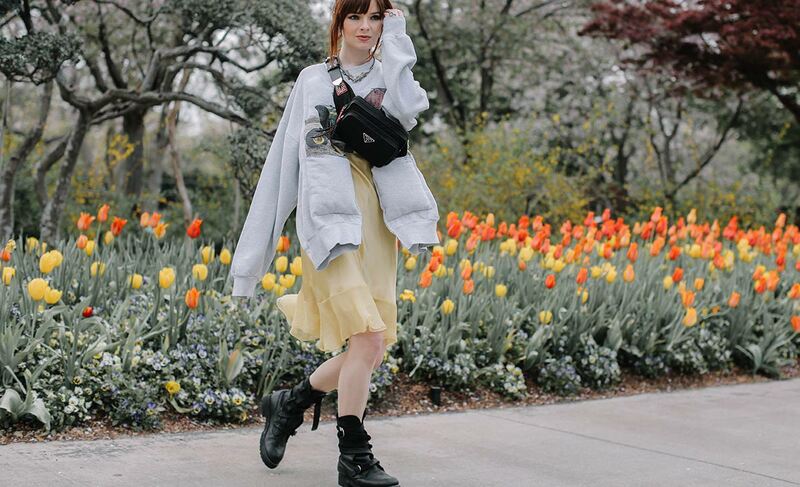 Same here- I just got a belt bag and will predominantly wear it as a short cross-body style bag (like the 2nd and 3rd pictures) vs. as a fanny pack. And I tend just to wear belts in my belt-loops vs. at the natural waist over a blazer or dress, because my waist is short, belts in that position just feel like they’re sitting on the shelf of my hips and there’s no space for them haha. But I love mid to skinny belts in the pant’s belt-loops- in The Assassination of Gianni Versace series on netflix Gianni and Donatella usually wear their tops tucked into pants with a fantastic belt and it looks so complete. It’s funny that nowadays belts feel like a very optional accessory, especially for women. Maybe it’s because our pants have gotten stretchier/lower quality and it doesn’t look as good to have our shirts tucked in all the way around? But what looks more “finished” than a top tucked into a study pair of pants/jeans with a beautiful belt!